When it comes to industries where brand advocates play a key role, perhaps in no industry does influencer engagement play a bigger role than in sports. Superstar athletes play a key role in driving engagement to the brand—we see it every day especially on social media. TaylorMade-Adidas Golf company has seen a sales conversion rate of almost 3.5 times higher than the overall site average thanks to brand advocates. For TaylorMade the order value of customers who engage with advocates is 50% higher than the site average. 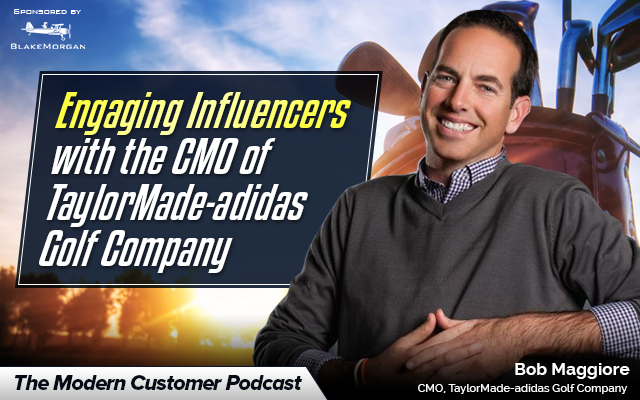 Today on the Modern Customer Podcast we get advice from Chief Marketing Officer Bob Maggiore of the TaylorMade-Adidas Golf Company. Bob oversees brand, product and consumer marketing efforts for TaylorMade Golf, which include advertising, public relations, social media, experiential, design and eCommerce functions. A 20-plus-year veteran of the golf industry, Maggiore, 46, has overseen nearly every key product launch since 2000. TaylorMade has been the No. 1 driver brand played on the PGA Tour for 15 years and counting, and its Tour staff includes Dustin Johnson, Jason Day, Justin Rose and Sergio Garcia, all of which are currently ranked in the top 20 of the Official World Golf Ranking.